If you want to take your golf cart nighttime experience to the next level this is a must have. This kit is super easy to install and features Bluetooth technology with 16 Million Color capabilities and built in DMX for music mode. This all new Golf Cart LED Light Kit for the underbody of your golf cart is the latest addition to the golf cart craze. If you want to take your golf cart nighttime experience to the next level this is a must have. This kit is super easy to install and features Bluetooth technology with 16 Million Color capabilities and built in DMX for music mode. 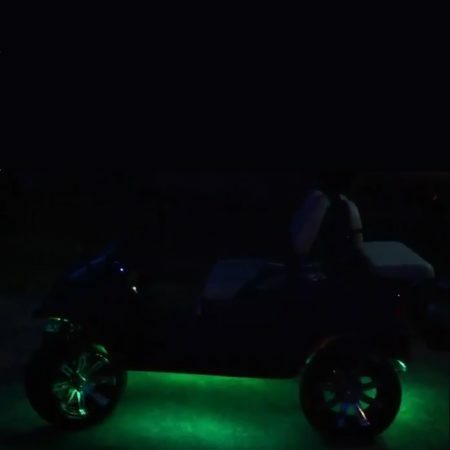 You can cruise the strip with just the golf cart led light kit set on a specific color or you can jump on the latest craze in the golf cart world with music activated LED lights on the underbody for your golf cart. Wireless connectivity via bluetooth technology from an Android or iphone allows you to control your golf carts sound system and light from anywhere. 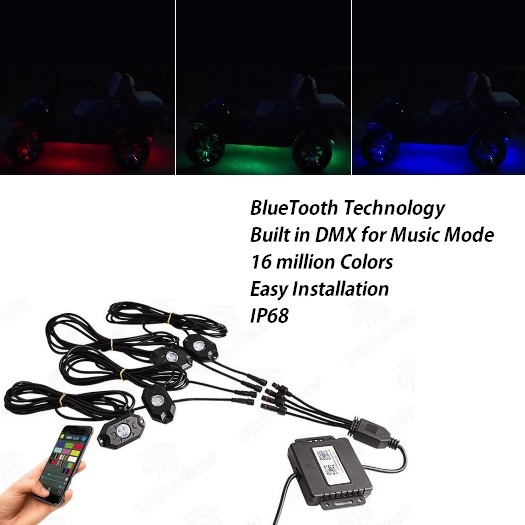 Be the first to review “Golf Cart LED Light Kit Underbody RBG Music Mode Bluetooth” Click here to cancel reply.